For those special moments in your life, why not have something uniquely customized just for you? At Riginov we offer all our customers a bespoke jewelry design service. Our expert team is on hand to help you realize your dream from a simple idea into a beautiful piece of jewelry, an heirloom that will be cherished and loved forever. We will work closely with you and guide you through the whole process, to create a unique design that matches your requirements and reflects your personal style and budget. 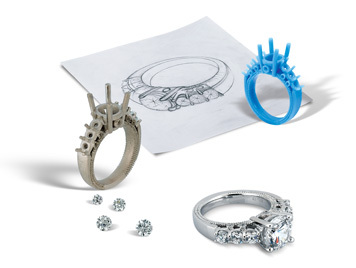 Once your design ideas have been captured, it will be realized through 3D computer-aided design to provide a visual preview of your bespoke piece. When you have approved the final design, our craftsmen and master goldsmiths will produce your piece of jewelry using the traditional craftsmanship and latest technology. To start your journey with a bespoke masterpiece, please contact our Customer Service at info@riginov.com.